Two-dozen alumni joined the undergraduate members of Psi Chapter of Phi Gamma Delta as the Wabash College fraternity broke ground on a new chapter house. The $5.1 million house, designed by Psi Chapter alumnus Jim Riddle ’86, captures many of the same architectural elements found on the current chapter house, which was built in 1927. "We started with a Tudor style to match the traditional architectural design from 1927," says Riddle, who owns his own architecture business in St. Louis, Missouri. "The front has three large gables which symbolize the Greek letters of Phi Gamma Delta and stand for the principles on which the fraternity was founded. It has six large windows in the front which symbolize the six men who established the fraternity. And we worked in a diamond theme throughout the house, so in many ways the physical structure is the embodiment of the fraternity's principles." The chapter house's capacity will be 65. Riddle points out that the most significant difference is in room size; study rooms will be approximately twice as large as current rooms. "This is exciting because today's college students bring so much with them—computers, refrigerators, stereos; it's not like the time when the fraternity was built and men pretty much came to Wabash with just a suitcase," adds Riddle. The new fraternity will feature a much larger kitchen, plus a student kitchen that will be open for students to grab a bite 24 hours a day. There are several shared study, conference, and computer rooms, primarily on the upper floors. Central air conditioning and a sprinkling system are welcome additions to the new house, amenities the old chapter house didn't have. "It's amazing how many college students die from faulty wiring and fires on campus," added Riddle. "So while students don't think much about modern electrical and sprinkling systems, the new house will certainly be a much safer place to live." "This has been a six year labor of love," says Psi Chapter Housing Corporation President Greg Miller ’83. "It's so nice to finally break ground on the project that builds on the chapter's history and traditions, but will serve future generations of Fijis." Miller pointed out that Psi Chapter alumni have raised approximately $2.5 million toward the project's estimated cost of $5.1 million. "We've done a great job of raising funds so far, but we still have a lot to do. We feel like our alumni will be excited about the unique opportunities the new chapter house will provide for the undergraduates." The house is being constructed directly across Grant Avenue from the Center Hall parking lot. General contractor for the project is Geupel DeMars Hagerman of Indianapolis. Constructed is set to conclude in time for the beginning of the 2006-2007 school year. The project is part of the ongoing Fraternity Partnerships, which are part of the Campaign for Leadership. 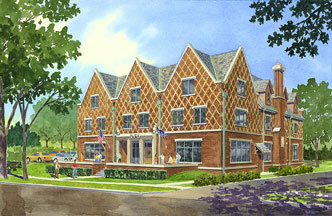 Top: Architect Jim Riddle's rendering of the new Psi Chapter house. Homepage: Craig Green ’59, Jim Riddle ’86, Greg Miller ’83, Don Smith ’59, President Andy Ford H’03, and GDH Representative Terry Travis.